Your website has been up for a few months. The initial excitement has worn off. But still, every morning you wake up and head straight for the computer. Open browser, favorites, traffic stats. Seeing basically the same number that has greeted you every morning for the last couple weeks, you head for the shower. There your tears wash down the drain. At least that is how my mornings go. This website has been hovering around 50 visitors a day for the last couple weeks. A gray cloud is beginning to form above my head. As you can see there have been good days and bad days. But no discernable upward trend. It hovers around 50. The two spikes are from the two times that the website was listed on reddit.com. But the spikes are lightning bolts. Exciting while it is happening but gone in a flash. Looking at the graph it appears that the website is not progressing. There is no upward trend. I want an upward trend. I need a ray of sunshine to peek through the gray clouds. So I created a graph that has an upward trend. I call it the Extrapolated Traffic Graph. 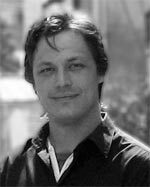 It takes traffic from recent time periods and extrapolates what the total traffic would of been had the traffic always been what it is now. (Feel free to re-read that last sentence. Sorry, but I can not improve it). The time periods start from the most recent and narrowest time frame and move to the past with increasing time frames. It is best explained with the actual graph. 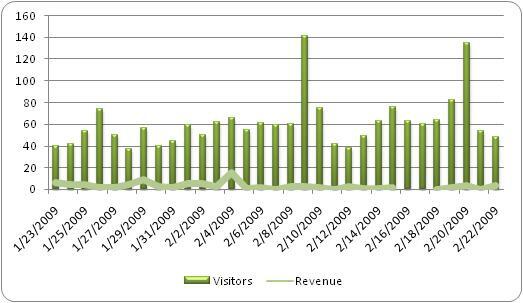 Here is the Extrapolated Traffic Graph for February 22, 2009. See – an upward trend. To help understand how the graph works it is best to view it as an answer to the question: What would the total traffic be if all the past daily traffic was the same as the daily traffic for the last # days? For the last 4 days traffic was 319 visitors. Take the number of visitors (319) and divide by the number of days (4). You get 80 visitors per day. The website has been up for 53 days. Multiply the visitors per day (80) by total days live (53) and you have extrapolated total traffic of 4240 visitors. Now compare that against your actual total visitors. Extrapolated 4240 compared to actual 2206. Vwola – the website is progressing nicely. Keep doing this for all the different time periods and you get a nice uptrend graph. The reason it works is because the website is progressing. The problem with the normal traffic graph is that the progress is hard to see. The progress gets lost in the noise. One day traffic is high, then 3 days in a row it is low. These 3 days make it look like you are loosing ground. But you are not. You are still better off then you were a month ago. And that is the point. The magic in the Extrapolated Traffic Graph is that is gives more weight to traffic closer to the present. For new websites the present is always better then the past. The Extrapolated Traffic Graph is not misleading. This website’s traffic is progressing. It has to be. Everyday I add more content. I visit forums and leave thought provoking posts. I submit the website to directories. I make jaw dropping comments on other blogs. It all adds up. The website is better then it use to be. But the standard traffic graph just does not show it. Extrapolate present traffic, compare it against actual traffic, and the progress becomes clearly visible. 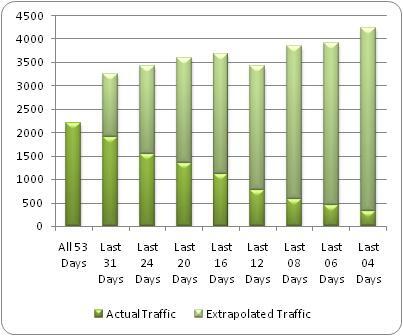 If you are at the beginning stages of your website then I recommend you plot your own Extrapolated Traffic Graph. Print it out and hang it on the wall. Then every time dark clouds begin to form – have a look at your up trending graph. Save the tears till your really need them. Like when even the extrapolated graph trends down. Hi I just wanted to say I think you have done a great job with your site–it is interesting and well-done, and I learned from you–even though my hubby and I have been in the web business for some years now. What we newbie webmasters/bloggers/etc. have to remember is that we ARE all in this together, and that it does take time to see any sort of return for our hard work. I think the world is basically in a short-term frozen pattern like a deer in the headlights, everyone is frightened, and worried about money (certainly at least here in the US!) But that fear etc. cannot last forever. Be of good cheer, I think you have got rule #1 down pat. Websites must add value to people’s lives and that’s exactly what you have done here. Keep up the good work, stay sane, think positively! I have to agree that you are doing better and better – because I keep coming back!